What is YOUR go-to Sox cap? I tend to wear Sox caps a lot during the season. What is YOUR Sox cap of choice? For years I had an old beat-up adjustable one (it looks a lot like the President's). The only problem was that somehow it faded into a navy blue. Quickly. So, after this past season ended I decided it was time for a new cap. My authentic New Era one is a little big (need to send back for a smaller size; [New Era must have really inconsistent sizes because I have a Giants cap that's the same size but much tighter on the my head]) and I also find that they tend to fit non-big leaguers' heads funny, so the above cap will probably end up being my go-to. I have caps marking the period 51-63, 71-75 and the current one. I prefer the red 72 one myself. I have about a dozen Sox caps in my closet. I used to love the fitted caps, but I've found they shrink and stain after so many times being worn to the park. My '59 Sox American Needle and '05 World Series hat fit a bit more snuggly than they used to, so they don't get as much wear. I bought a low-crown fitted 5950 in 2010, and that's never recovered from the sweat stains incurred on Frank Thomas Tribute Day when I sat in the upper left field corner. Top three right now are the 2003-2006 BP hat, the '47 Twins diamond-sox cap, and the '47 Twins white panel/sox logo cap. All three caps I've rinsed off with soap and water at various points, and they always come out feeling and looking great. The '47 Twins hats are moving up the list. There are a couple more I'd like to pick up someday, but Lids.com seems to be out of certain sizes. My White Sox "bling" hat! Right now, it's this Cooperstown collection 1983 hat that I got for my birthday last year, which was cool since I was born in '83. Before that, it was just a standard normal black one that I wore for years. My go-to hat is my fitted 1972 red hat. I wore it when we won the Series and it only get worn on special occasions, except this year I wore it at Sunday games. The World Series cap only gets worn when we get back there. I also sometimes wear a fitted black Sox hat at times, and I also have a fitted 1917 white cap for games in hot weather. My everyday hat changes from year to year, I like the preworn caps and the two tone adjustable hats with a white front. Got next year's everyday hat already, a preworn mid 60s block letter SOX dark navy adjustable from '47 Twins. Last edited by russ99; 12-17-2012 at 10:42 PM. My go-to cap for playing and going to the ballpark was a fitted cap I bought at Grandstand in 2000 on a hot Sunday afternoon before a Sox game in the glorious summer when New Comiskey was the funnest place on earth. The current regulation cap, then and now. It has some stains now, but it remains the most comfortable cap I have. My go-to cap for hiking and adventure used to be a khaki cap, a former Cell giveaway, that I was given. I did a lot of hiking in it in Southeast Alaska, where it sheltered me from the rain. I lost it one day while hiking in Hawaii when a gust of wind took it into the trees downhill from me. I do have a lot of caps from different eras and different novelties. Except for Sox games, and the Sox might come to Oakland just once a year, so I don't get to many, I don't wear caps much anymore. 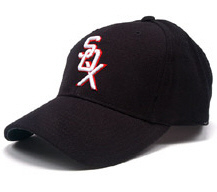 I bought a new Sox on field fitted hat when they came out back 07. Since then, it has literally been through rain, sleet and snow. It fits perfectly on my head and is so broken in. I love it. The goto is the current onfield cap. 5950, low crown. I wear it all the time, it's well broken in and has the sweat stains to prove its been used. On occassion when my wife gets completely sick of looking at me in it, I trade it out for the Cooperstown 71-75...the "red cap", or the two seph mentioned in the original post: the '59 Go-Go-Sox cap, and the blue one from the twenties (?). I think I have about 6 Sox hats and my go-to one for a while has been the 1987 47 series all navy hat. Considering the weather now, this is my go to White Sox toque. Mine is "Winning Ugly"-era cap that I've had since probably 1984. The adjustable kind with the mesh back. On-field regulation cap. I think I've had mine since '08 and it's pretty beat up. I kind of prefer that it's worn, so that it's obvious I'm an actual Sox fan and not wearing it for fashion (I guess those are the breaks when your team has a badass logo).